Easter Special - Want a visit from the Easter Bunny? Simply order the San Churros Funfetti Easter Pack for your chance for it to be delivered with a real life bunny for a petting experience. Menulog delivers for San Churro - Eastgardens so you'll be able to track your courier on a map. 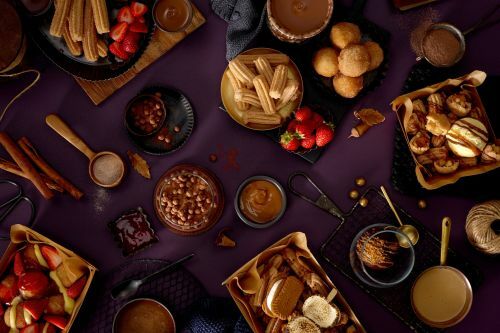 Includes fresh-made bunuelos (Spanish doughnut balls) rolled in cinnamon sugar, drizzled in customers' choice of 2 types of chocolate, topped with strawberry floss and funfetti. Churros for two and two hot or cold drinks (extra for shakes). Cozy on up with this perfect package for the loving couple, or even if you're 'just friends'. Made Fresh to order with Spanish Choc-Hazelnut filling. Contains nuts. Strawberries with your choice of chocolate fondue. Fresh Strawberries and ice cream. Mixed berries and pomegranate, apple-mango juice and ice.